Hello blogland. I have been on quite the hiatus. My mojo left me for a good long while, but it's back and can I just say....it is ON!! You can now follow my blog on Bloglovin!!! 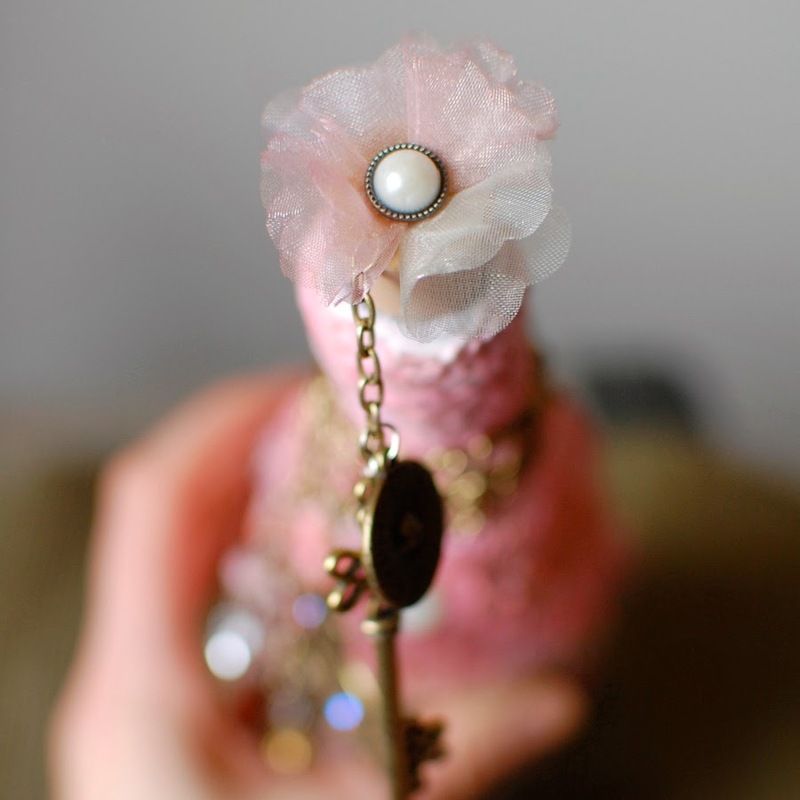 If you prefer Bloglovin just click the widget to the right. I have posted a few on the swirlydoos facebook gallery but haven't made it here. I'm warning you now that this post is very photo heavy. 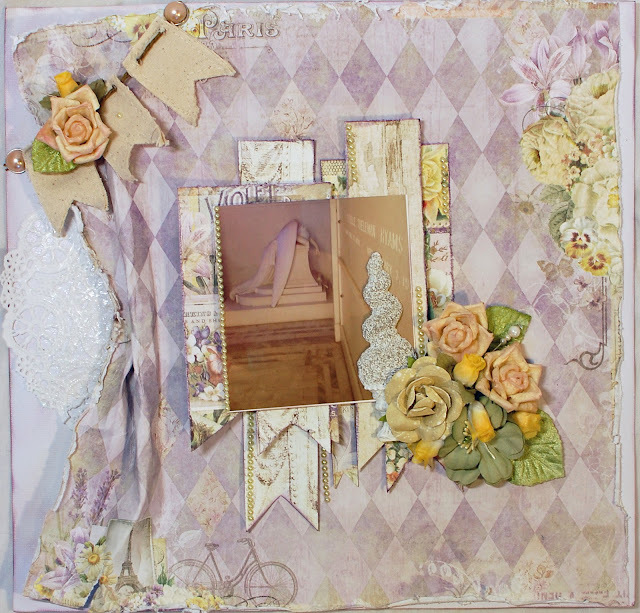 This page was created using Donna Salazar papers,, various Prima flowers and pieces from the Prima Almanac collection. I used Prima's Optimist collections for this one. I had started the background a couple of years ago and just needed to pick it back up. I really loved the die cut frames. I've also been hoarding Prima doors forever and this was my first time using them. This page actually won layout of the month over at swirlydoos in March. This is a conglomeration of a few kits and one of my fav stamps....that bird cage is fantastic. I was lucky enough to find Prima's Nature Garden in Jodi Lee's Etsy store to make this LO of Aubrey's costume from 2014. This is an exploding box card I made for hubby for his birthday. The entire thing collapses flat. It was very fun and turned out very cool. This is a LO made with the February kit using lots of Prima Salvage District and even some really old stuff from my stash. This is another LO with the Swirlydoos February kit. I just adores the Blue Fern Studios papers here. and my final LO to share is another of my Aubrey Sue. This is one is one of my favs lately. There was so much detail here and it just came together so well. I hope you enjoyed seeing some of my work. I have some of my latest stuff yet to post as well, so stay tuned. 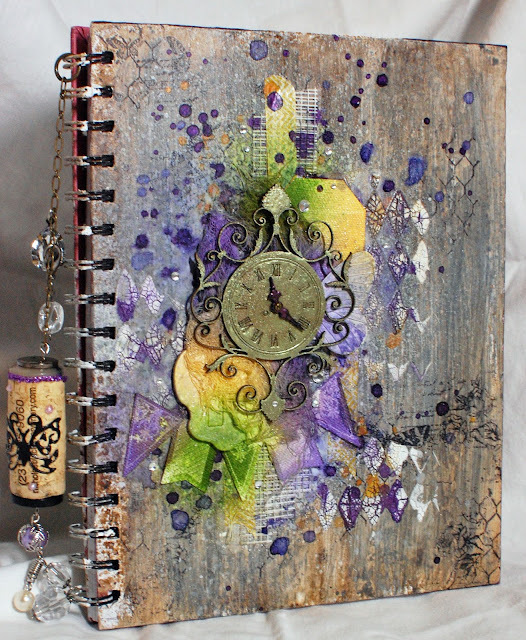 Today I would like to share some pages I've made with some recent Swirlydoos kits. I used Tattered Angels Glimmer Mist in Patina and Aquamarine (One of my favorite color combos) I was a little heavy handed under the photo but the bit on the right is so soft and perfect! Live and learn. 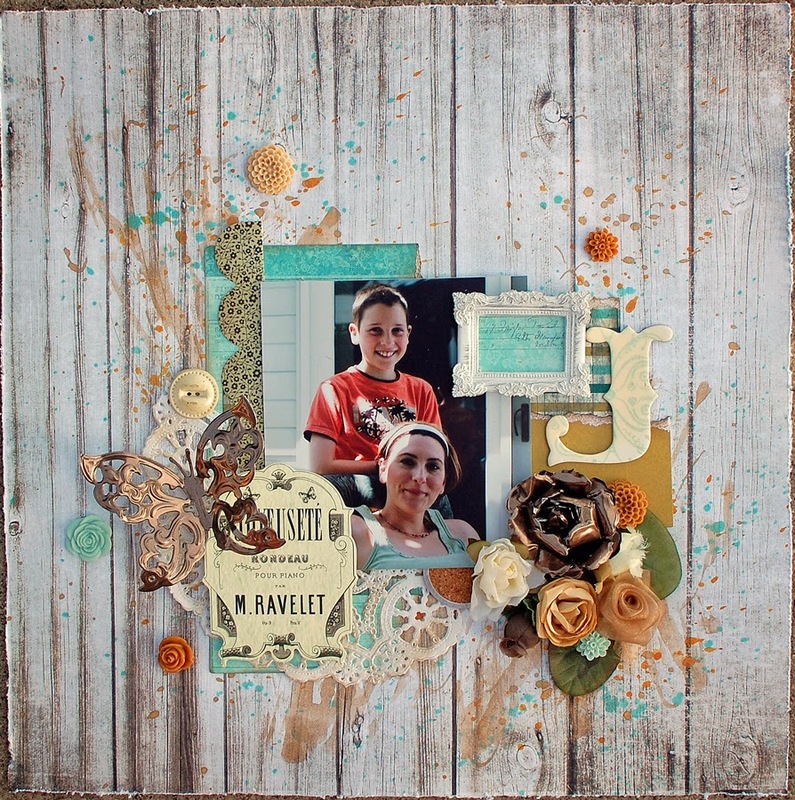 There's lots of layers using the wood pieces and journaling cards from the Prima Debutante collection. I thought the wood piece which became my title was absolutely perfect. The stamp is inspired by other papers in the kit which have a lamp post image. I decided to add my own with a Leblanche stamp that I've had for years. 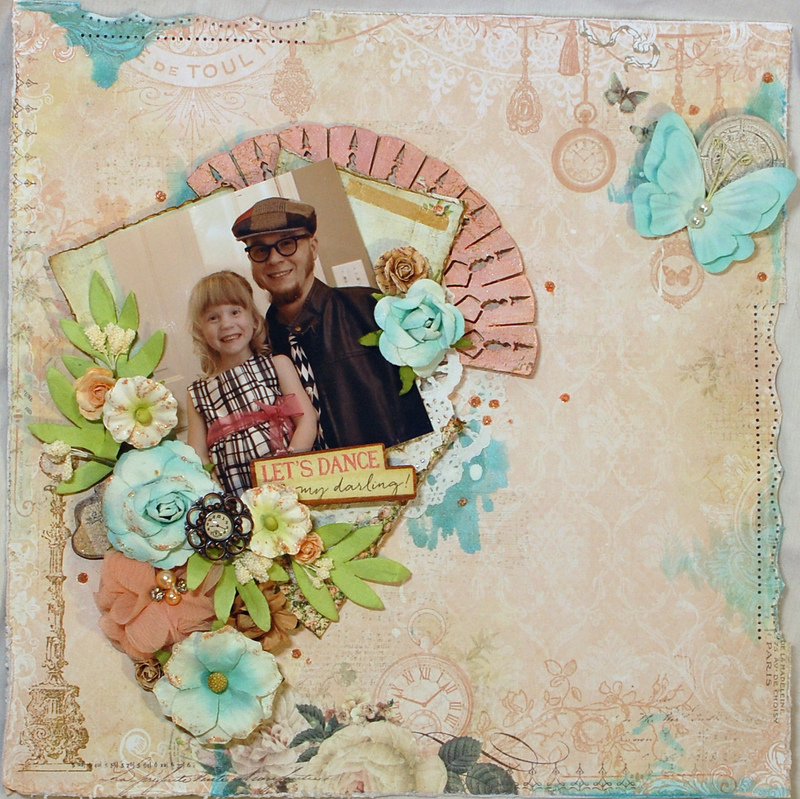 This is a layout made during swirly camp in Bailey Colorado using the same kit...Belle Fleur. The roses are from previous kits and have this wonderful wax coating that is just amazing. the resin is from a 2013 kits and worked perfect for my weeping angel layout. again, this is the Deju Vu paper line and has so many details that with just some layering you have a magnificent page. Hope you enjoyed some of my latest creations! Today I have an altered notebook that I would like to share. I was inspired by this month's mood board over at Dusty Attic. Ironically enough, I had a Dusty Attic notebook sitting in my stash just waiting for some paint and chippies. I made the background using one of those Tattered Angels paint systems. Remember when we all just HAD to have them? Yeah I finally bust one out to mimic the barn in the photo. The bauble on the side is a cork from my collection of corks. Yes girls....you know you have them. I've always wanted to make SOMETHING with them and this is as good as anything else right? 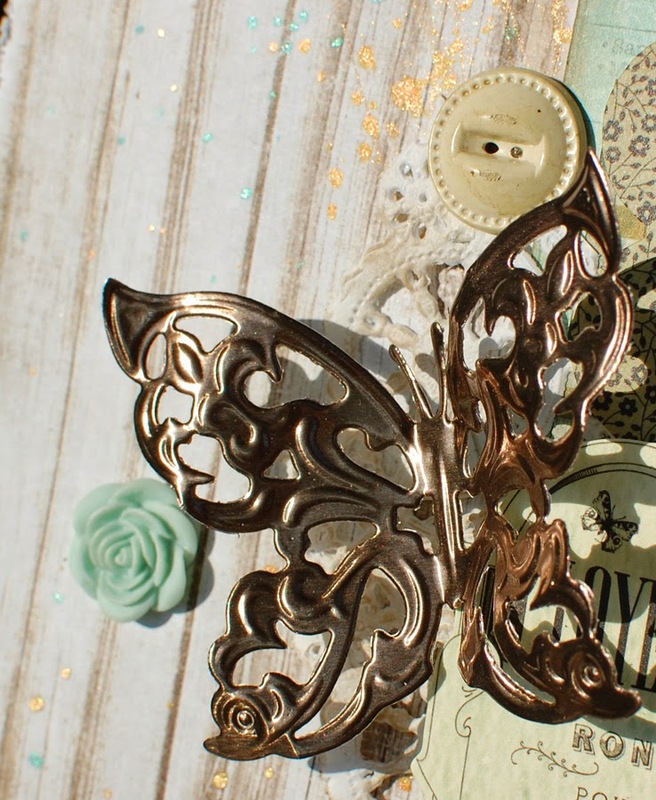 The butterfly is a spellbinders die and is cut from the metal sheets from Add A Little Dazzle. I wanted lots of layers and goopiness and stampiness and just good fun. And of course....I love to layer my canvas. 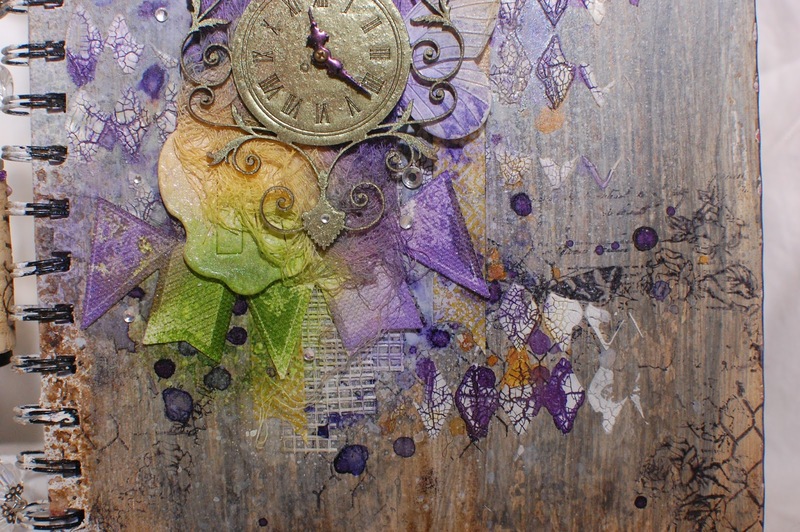 The clock is a DA chippie that I have been hoarding and I've covered it in Lindy's embossing powder in Spanish Moss gold. well, about as plain as THIS FABULOUSNESS CAN BE!!!! Hope you enjoyed my latest and greatest. 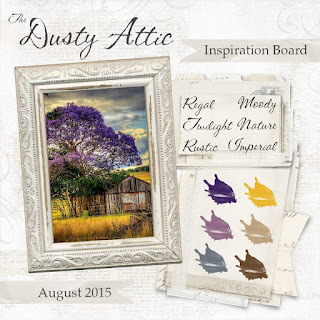 If you're looking for a little inspiration, check out the monthly mood board at Dusty Attic. If you have ever been to Louisiana then you will know, there are Fleur de-lis EVERYWHERE! It's even the symbol for the NFL football team...the saints!!! It's used in clothing, decorating, art, you name it...they've got it! So in an attempt to embrace my new culture, I decided that when my girlfriend Kim came to visit, we would do mixed media fleur de-lis canvases. I felt that this needed to be something Finn inspired...since I luv her too. 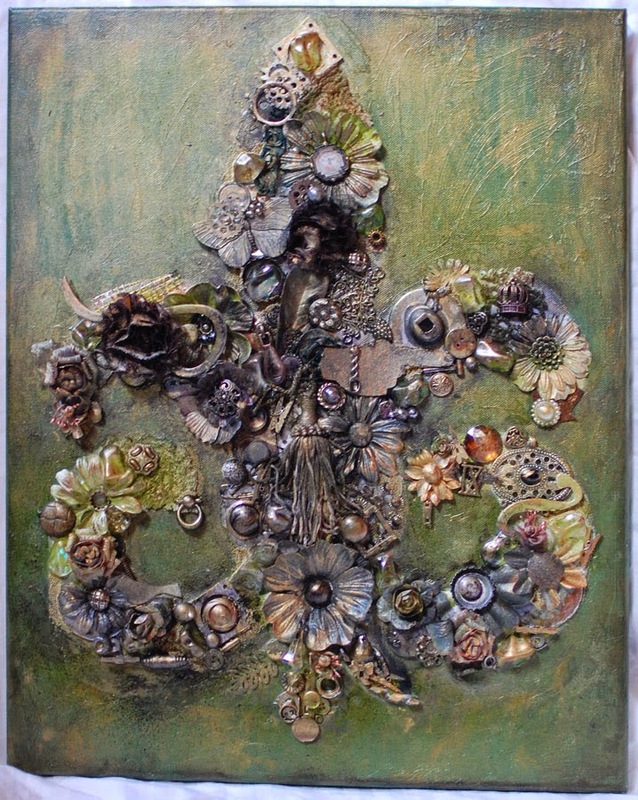 I started by free-hand drawing the fleur de-lis on the canvas, then mixed my own paint, painted the background, added another contrasting color (yellow), covered both colors with silks glaze in olive vine, and finally started gluing within the image itself. I used gloss gel medium to adhere all the bits and baubles to the canvas and then sprayed with varying mists including dylusions; black marble and dirty martini, and finally added the finishing touches with some silks glazes in emperor gold and honey amber. You can see in the photo above that I have used so many different textures in order to achieve a super eclectic look. The butterfly is a simple resin piece with layers and layers of mediums, causing a multi dimensional shimmer and color effect. The flowers are just simple paper flowers (Petaloo flowers here) of varying color and design. With all the mediums that are used, the underlying color is irrelevant and the mists and paints allow for an overall congruency in the piece. Chipboard is perfect for these types of mixed media projects! They absorb the color and come in so many shapes and sizes. This is just an old piece that I had in my stash. You can find lots of chipboard and wooden pieces at eP including Wendy Vechhi and 7 Dots studios! Other pieces to use are prima wood pieces like the fern on the lower left of the photo, some leftover nuts and bolts, various buttons, mini cloths pins, large plastic crystal pieces, bottle caps, and metal corkscrew chips that your hubby brings home from the shop for you;) Use your imagination, the sky is the limit. Only when I was done with the hours and hours of gluing did I realize, I haven't even made a DENT in my stash. Kim wasn't able to finish hers in time so I'll be shipping it home to her and hopefully she will post it to her blog soon. Hop on over to eP to purchase many of the items that I used on this project and play along with our fall themed challenge this month. 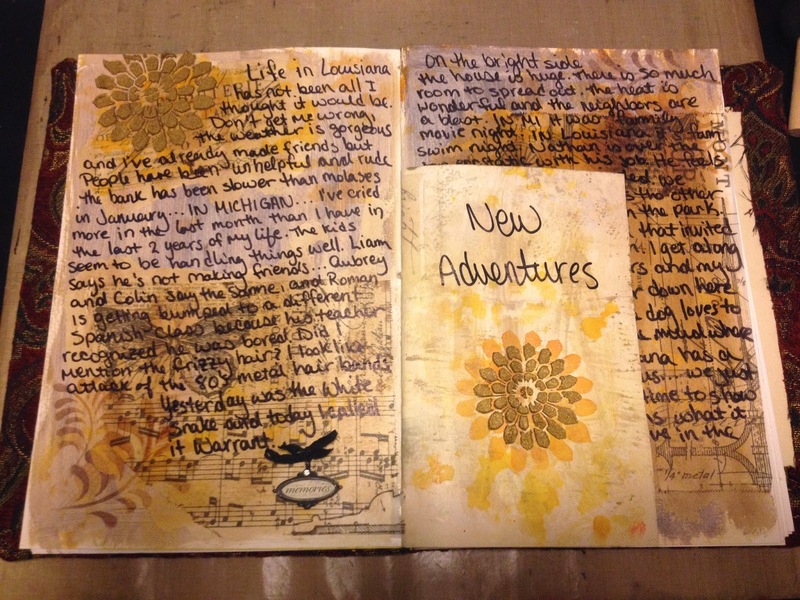 Welcome to the big scrappy blog hop! We are joining up as a chain of fun blog hop tours where so many of us will get to meet new bloggers, get new inspiration and connect with blogs that will open up our creativity. This is sure to get your mojo going. 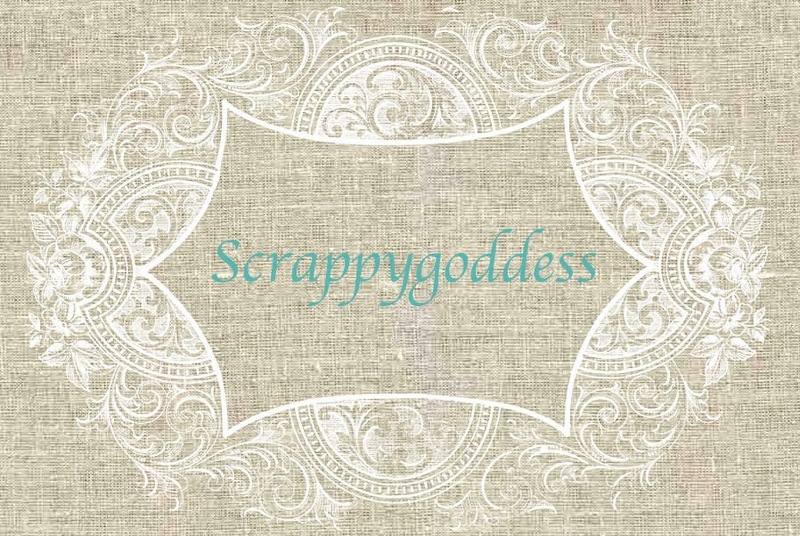 I have been nominated by my good friend and scrappy gal Rae Moses to be part of the big scrappy blog hop. Rae is currently the design team coordinator for Swirlydoos as well as a designer for Tresors De Luxe and Blue Fern studios. Her work is so over the top GORGEOUS and inspiring. Her style is so elegant, shabby, and romantic, it's easy to see why she designs for three such fabulous companies. I had the pleasure of serving a 6 month education team term with her over at swirlydoos a while back. 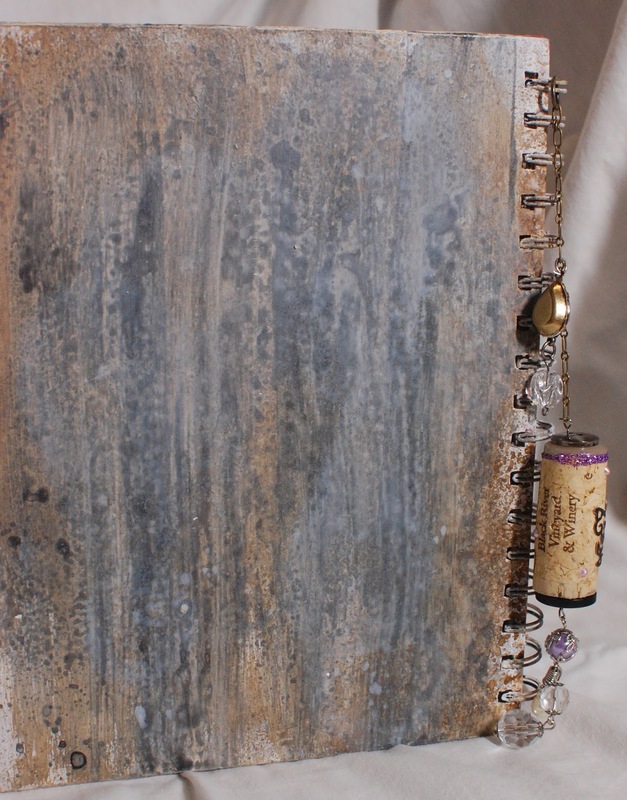 I am currently working on a page in my Louisiana art journal. Last week I did a therapeutic page documenting the trials and triumphs of moving 1700 miles from the only life I've ever known. I am halfway through a page documenting my GF's stay here in LA this last weekend. I adore color! Bright bold colors speak to me! Although I tend to be drawn to the pale romance of shabby chic styles, when I craft its the bold and bright that speaks to my soul. 3. Why do I create/Do what I do? Well, for starters I do what I do for the eP design team! I love to try different products, techniques, new things, and love the have the challenge of trying to inspire others. I find that when I am immersed in my crafting that I tend to get new ideas and inspirations...my fingers will itch to touch paper, and ink, and fussy cut with scissors! I craft for therapy! When I am happy or frustrated or sad I will craft. Just a few hours in my room and the world seems to melt away. Before I know it hours have flown by and my heart is full and satisfied with my gluttony of craftiness. I sit...and...stare! No seriously. If I am not necessarily inspired...if I've had a lot of time away from crafting, I will stare forever. I will place something...and stare some more. IT'S CRAZY!!! I don't really have a "creative process" so to speak. Now if I have a launching point, then it's a whole different ball game. 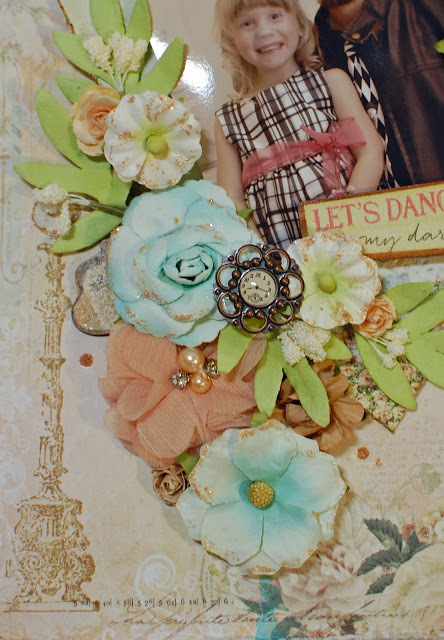 For example, I wanted to use a doll stamp and make a dress of flowers and also wanted to layer lace as the background. Knowing those things I just starting slapping stuff together making sure I include the techniques I want. It's much more free that way than to plan everything out. Erin is a previous fellow DT member at eP and another swirly girl. Erin is phenomenal with her free hand drawing and painting and makes the most wonderful canvases. 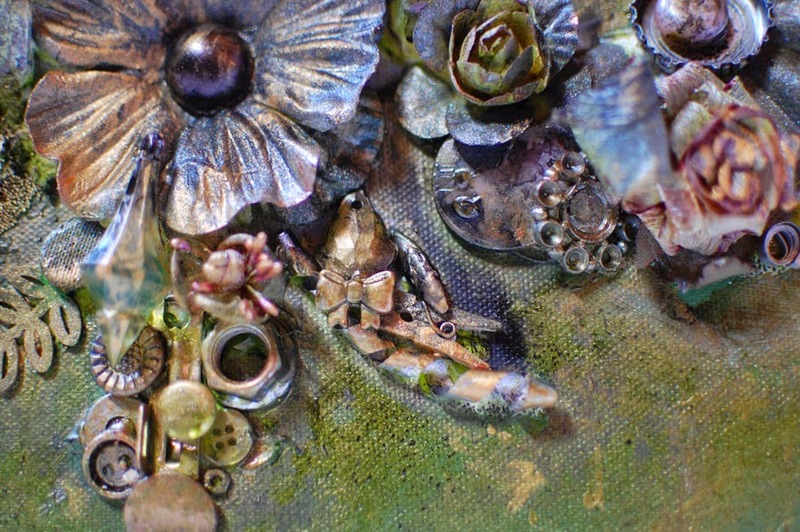 She does what she likes and loves to experiment with different mediums. Kim is another fellow swirly girl and HUGE source of inspiration. 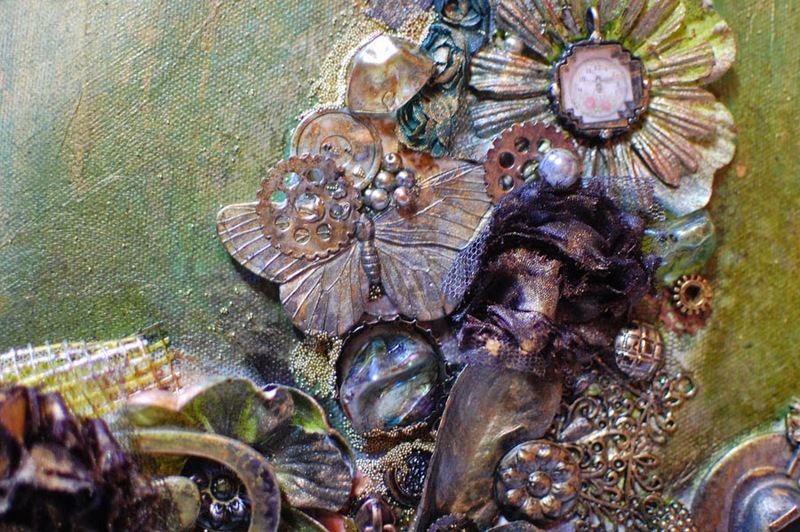 Kim's style is very elegant and romantic with lots of layers of mixed media within her layouts. 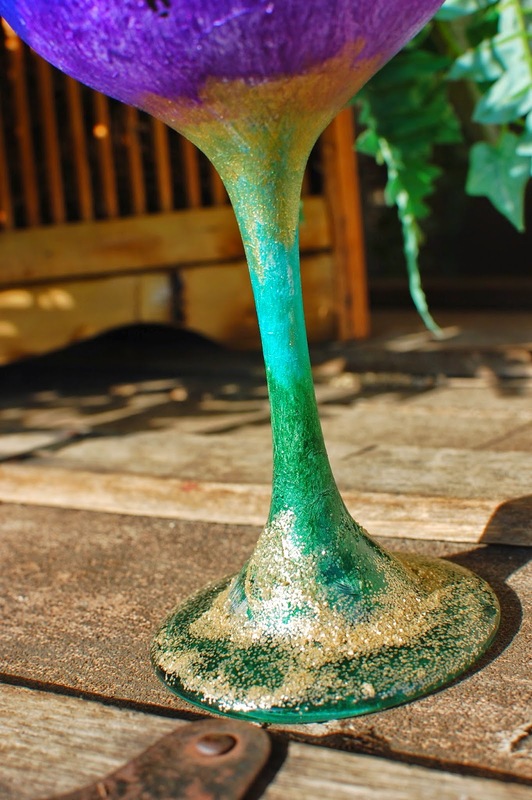 She has grown into her own style in the last couple years and is another one who is never afraid to try new mediums allowing her style to ever grow and evolve. Toni is a fellow EP design team member. She lives in the Uk and is yet another gal who LOVES to try new things. (you may notice a trend here). She is another lover of color and all things bold and takes crafting to a whole new level in my book. I find her work VERY inspiring and hope you do too. It's that time again! Everyone ePlay! 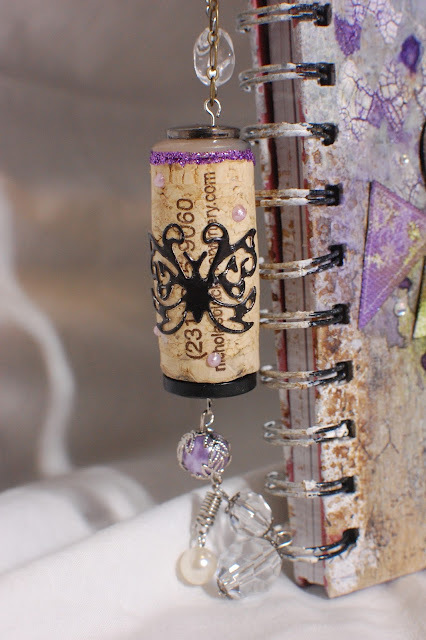 This month's challenge is altered bottles. Bottles are so much fun and when you drink as much wine as I do...well...there's never a shortage of bottles to alter. 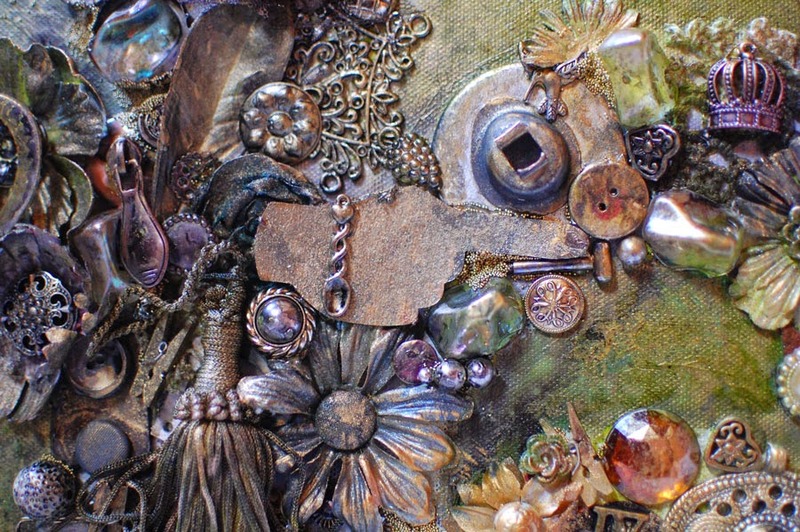 Lots and lots of found objects, charms, and gel medium. 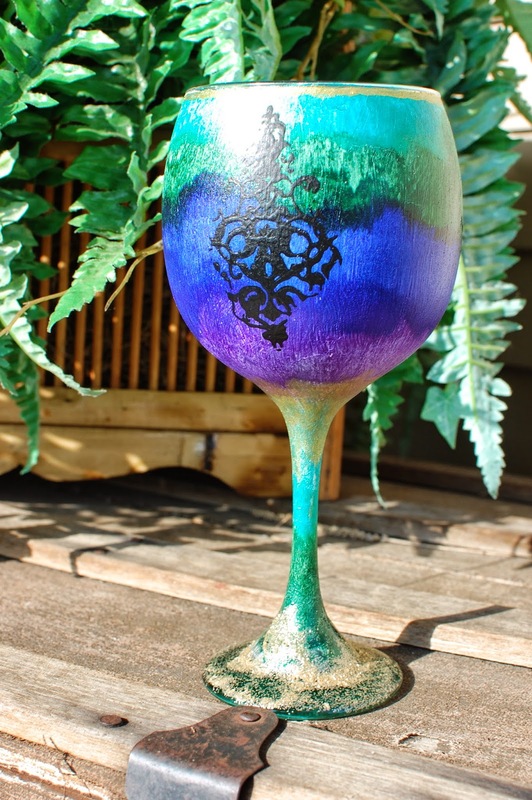 I used Luminarte primary elements in order to make a home made mist for the all over color of the bottle. I then used Viva Decor 3D stamp paint to stamp the image on the glass using my Tim Holtz Damask stamps. For the bottom I used E6000 and Sprinkled Distress glitter in antique linen. 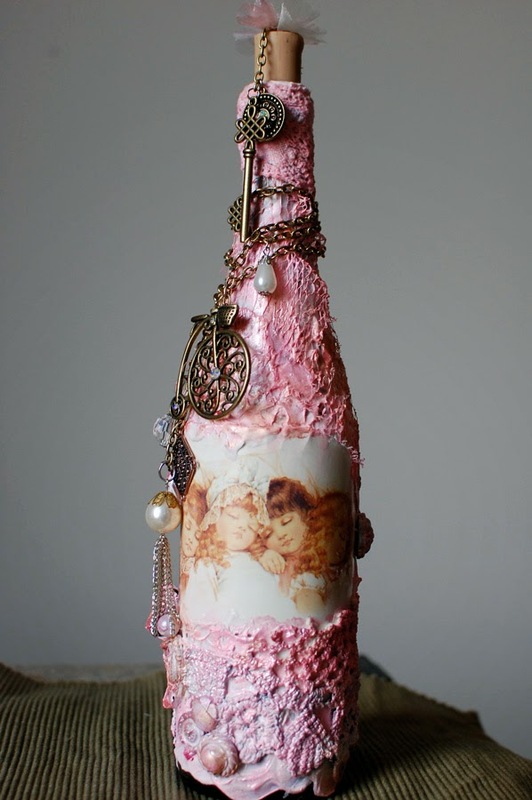 I hope you are inspired to make an altered bottle of your own. Make sure you post your link on eP for your chance to win a gift certificate to the eP store. 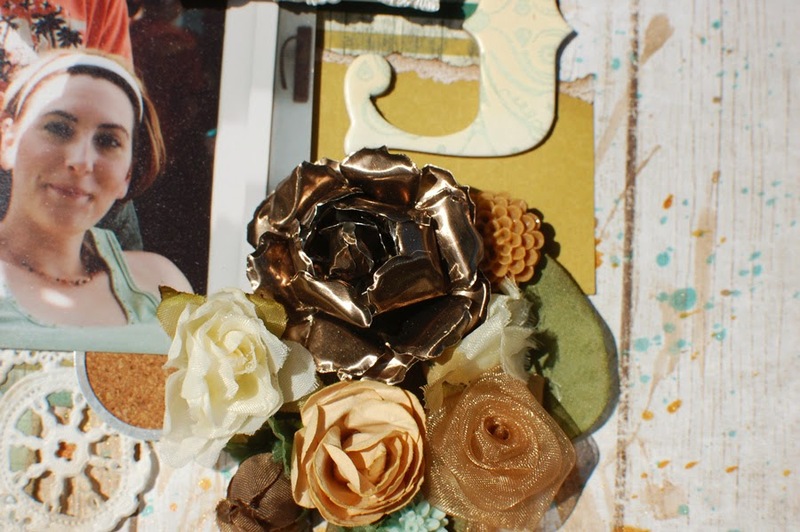 Welcome to our joint blog hop with Add a Little Dazzle. We are so excited to partner with them and have had so much fun playing with their products. They have a beautiful collection of metal sheets, in a variety of colors, that are perfect for mixed media project.Both design teams have combined our products and are ready to share some inspirational projects with you. Join in on the fun and make sure to enter for a chance to win an amazing prize. Welcome to Day 1 of the Eclectic Paperie & Add a Little Dazzle joint blog hop!We’re so excited to be sharing some fabulous creations featuring the wonderful products from both companies in today’s hop. We have two amazing days of inspirational projects so make sure to stop by tomorrow. I have never actually worked with color metal sheets before so this was something totally new for me! I also purchased a metal stencil from Add A Little Dazzle because I was dying to dry emboss. I decided a card would be a wonderful first attempt. 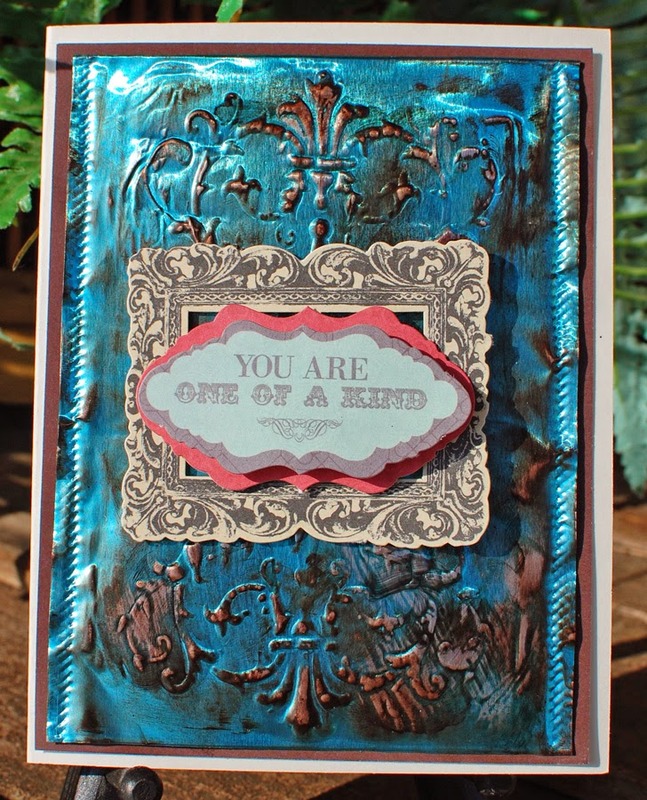 I used a baby blue metal sheet from Add a Little Dazzle with some solvent ink to add some distressing. I used a roller tool along the edges to create an embossed border. Note! The solvent ink actually takes the color off the metal!!! It's a very cool distressed effect but be prepared. Next I decided that they were so shiny and pretty I wanted to die cut with them. The metal worked so easy with a squishy pad and stylus, it was amazing. Here is the finished page. For the background page I used a piece of Fancy pants Nautical collection and for the torn pieces I used Authentique's Naturale collection. The frame is Prima Ingvald Bolme collection. Don't forget to leave a comment on each blog to qualify for a prize. I hope you enjoyed our little hop. And don't forget the ePlay challenge still going on over at eP to win a shopping spree in the eP store!